Also called Gossamer or Feather-Weight; the finest wool we stock. For instant heirlooms like the legendary Wedding Ring Shawl and nearly all the samples in Gladys Amedro's Shetland Lace and Sharon Miller's Heirloom Knitting. Material: 100% Wool Weight: Cream and White, 25 gram ball. Black, 25 gram ball on cone Yardage: Cream and White, 426 yds. Black, 379 yds. Approx. 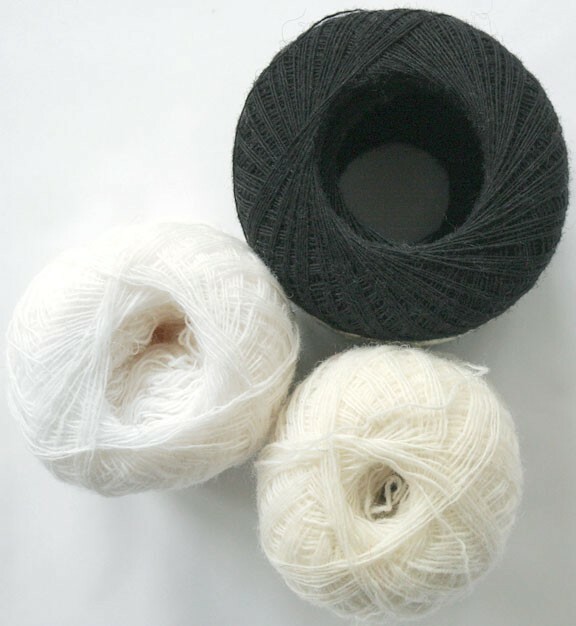 Gauge: depends on the type of lace fabric you wish to produce Price: $12.50 per ball or cone. Choose the quantity for each color you wish to order and click Add to Cart at the bottom of the page.